The panel discussed Xeloda in the treatment of patients with locally-advanced or metastatic breast cancer following failure of Bristol-Myers Squibb's Taxol (paclitaxel) and an anthracycline-containing chemotherapy regimen. Xeloda is the first of a new class of anticancer agents called fluoropyrimidine carbamates and is described by the company as the first orally-available, tumor-activated anticancer drug. It is a prodrug of 5-fluorouracil but promises reduced side effects in comparison by providing activation of 5-FU predominately at the tumor site. 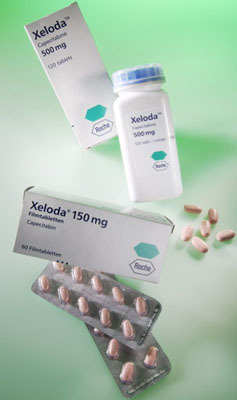 Xeloda (capecitabine) is an oral chemotherapy drug, approved by the U.S. Food and Drug Administration in 1998 for the treatment of metastatic colorectal cancer, Dukes’ C colon cancer (with complete removal of the tumor), and metastatic breast cancer that has not responded to Taxol (paclitaxel) and anthracycline-containing chemotherapy such as Adriamycin. 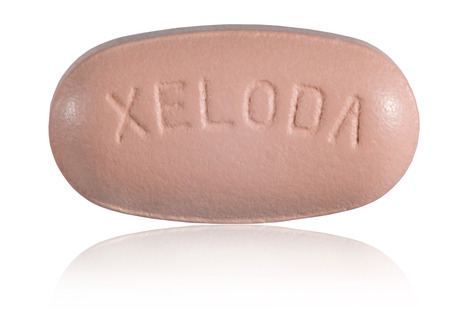 Xeloda is an oral chemotherapy medication used in the treatment of metastatic breast and colorectal cancer. In the body Xeloda is enzymatically converted to 5-fluorouracil, a chemical which may help reduce tumor size and hinder the progression of disease by preventing RNA processing, protein synthesis and DNA synthesis in some cancerous tumor cells. Roche Laboratories have reported that Xeloda® prescription patterns have shown “very good signs of growth” for the off-label use in adjuvant colorectal cancer and they are anticipating its approval by mid June. The changes in reimbursement patterns have helped with the growth of Xeloda® sales and more people have started using the product off-label in the adjuvant indication. Sales were down 49% in the first quarter of 2004 due to wholesaler inventory levels and buying patterns, but these have changed and contributed to the 74% increase in the first quarter of 2005. Medicare Part B reimbursement for physician administered drugs went from being based on average wholesale price to the average sales price plus 6% on January 1, 2005. Roche held off on increasing the price during the first quarter of 2004 due to CMS agreeing to reimburse Xeloda® at 90% of the average wholesale price for 2004 instead of the standard 85%. Xeloda® is the first oral chemotherapy drug used in the treatment of metastatic breast cancer and metastatic colorectal cancer. It works to stop cancer cells from growing and decreases the size of tumors. Xeloda® is currently being studied in other combinations and for several other types of cancer. It was approved by the FDA April 30, 1998, and is covered by Medicare.